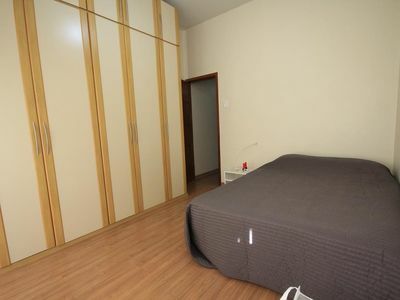 GoHouse has rental properties in Copacabana, as Freitas 1114: A 1 bedroom accommodation in Rio that sleeps 4 people in great location; close to everything. Learn a little more about this fully furnished and ready for your stay property. Its living room has a sofa bed, ceiling fan, TV and a table for work or dining. The bedroom has air conditioning, ceiling fan and double bed. The apartment also has a full bathroom and kitchenette equipped with microwave, cooking utensils and refrigerator. Accommodation in Rio for 4 people in the same block as Copacabana beach! Freitas 1114’s building is well managed and concerned its residents’ welfare. Therefore, offers daily cleaning in the common areas and 24 hour concierge services. Moreover, its location also deserves mention: after all, is one block away from Copacabana beach, so in less than 3 minutes you will be in one of the most popular tourist spots in the world. Despite being a quiet street, Paula Freitas has plenty of local shops, restaurants and bus stops. Also, there is the Siqueira Campos subway station for your transportation. At night, the neighborhood comes alive with bars, pubs and even nightclubs shaking the region. Did you like this or want to see more properties to rent with GoHouse? Just call us and find the perfect accommodation in Rio for you!